Dong Ho is a small village in Thuan Thanh, Bac Ninh province, located on the southern side of the Duong river (30km to the east from Hanoi,) is one of the villages that remains to preserve ancient cultural relies of Kinh Bac area (red river delta, north of Vietnam.) 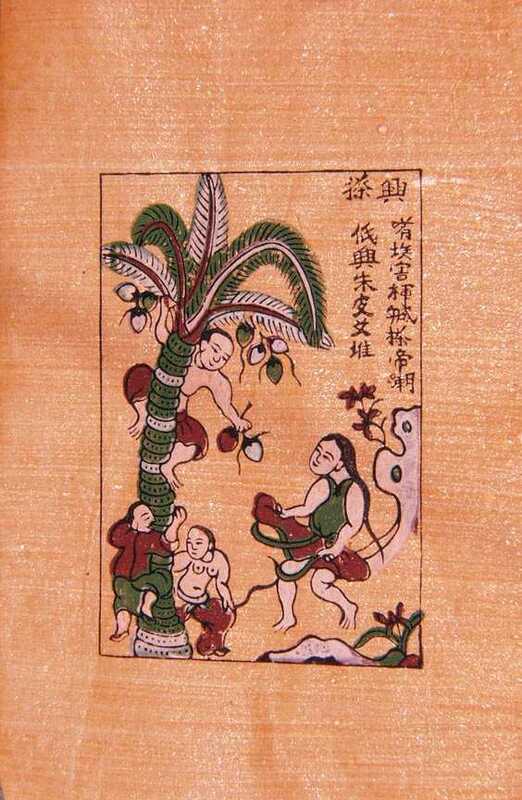 Dong Ho paintings have about 300 years of history in the north of Vietnam. Dong Ho folk painting is very famous because Dong ho is the only village where people know to make the "Dzo" painting with completely natural materials. The printing paper is made of bark of a tree called "Dzo." The background paper is originally white. People use natural materials to change the colors of the papers which are usually orange, pink, yellow, purple,.. Colors of the painting are refined from various kinds of tree leaves, that people can easily find in Vietnam. Particular, the red color is taken from earth of hills and mountains; the black color is from coal of burned bamboo's leaves; the glitter white color is made of sea shells; The original point of Dong Ho folk painting is the durability of colors. The painting is covered by a layer of sticky rice paste (called "ho nep") to protect the painting and their colors. These paintings are bought in Dong ho village, and are made by Mr. Nguyen Huu Sam and Mr. Nguyen Dang Che, two famous masters of Dong Ho folk painting, who are still living in Dong Ho village. Each painting is completely hand printed on Dzo paper following the ancient style and tradition. The provocative color is made by natural material. Especially the glitters are made by sea shells. We are happy to introduce Dong Ho folk paintings, and welcome you to a unique Vietnamese ancient art.